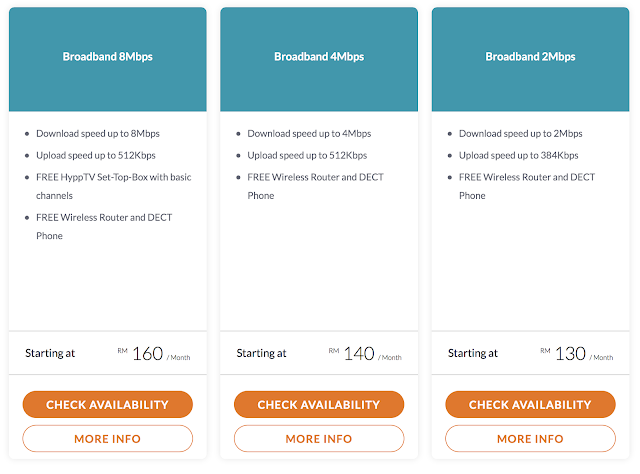 Unifi to most of us is known for its premier high-speed broadband service under Telekom Malaysia Berhad (TM) and recently they have announced their refreshed brand look and feel, welcoming a new era in connectivity leading towards accelerating coverage and empowering digital technology. 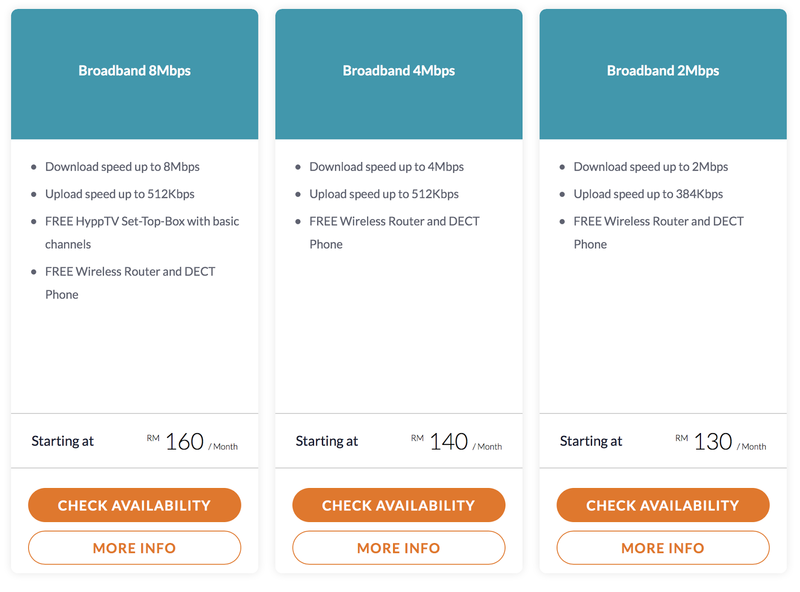 Other than showcasing its latest look, unifi is happy to share with their customers more offerings from unifi home, unifi mobile, unifi tv and unifi wifi. So remember webe or HyppTV? 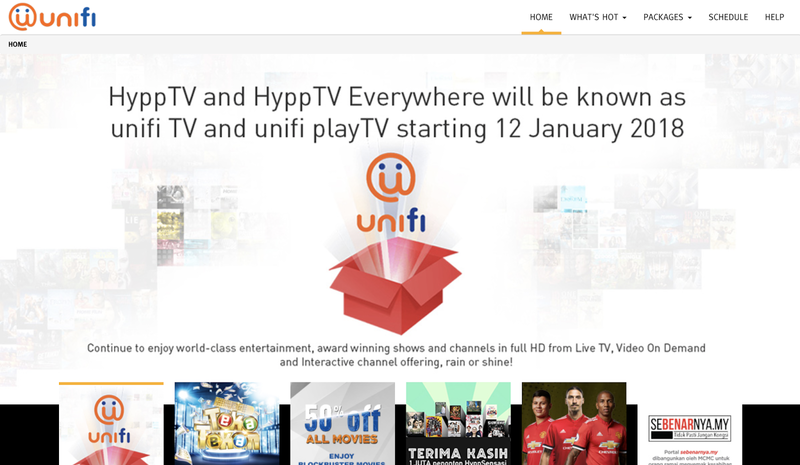 Just to simplify things for you, webe is now known as unifi mobile and HyppTV is now known as unifi tv as its rebranding effort for 2018. As unifi kicks off in 2018 with a fresh new look, unifi is now the one and only rand in Malaysia that offers truly seamless Internet connectivity everywhere; at home, public WiFi, mobile services and as well as a wide array of world-class content, under one roof. With unifi's continuous effort to perfect the coverage experience to enable better services to be assured to their customers, unifi strives to be the key enabler in realizing the nations Digital Economy aspirations as well as accelerating the adoption of a truly converged digital lifestyle and Internet of Things (IoT) that we all live in today. Let me break down the news for you below. To continue their unifi home services, to welcome a new year for everyone, unifi has taken an effort to introduce to you 'The unifi Perfect Squad' a.k.a 'Squad Sempurna unifi' to help you #installnow! This is to continue its Year-End promotion campaign that extends to areas where there are still plenty of available unifi ports around the country. The squad is activated to engage with household within the optimum radius of the ports to enjoy various special packages such as unifi Advance from only RM139 per month. 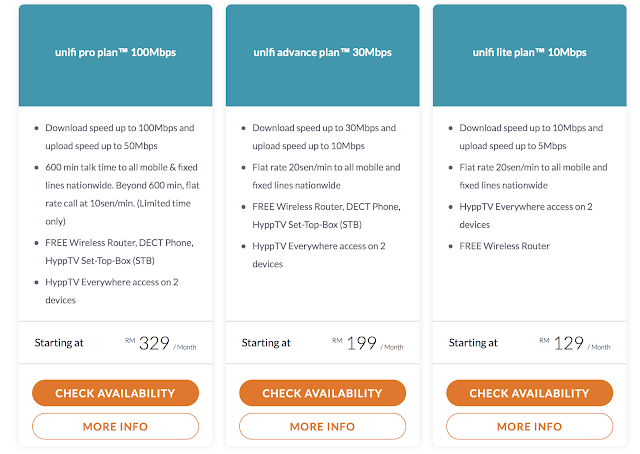 The packages also come with an array of unifi TV pack choices, devices, and call plans too! Ever thought about credit that wont expire for your mobile? unifi mobile (formerly known as webe) has continued to show an encouraging performance ever since the launch of its no data-quota plan in 2016. THis fully digital service will create another breakthrough in the country's telecommunications industry with the introduction of new unifi mobile #BEBAS ( #FREEDOM) Imagine a mobile plan that is neither a prepaid or post-paid product ubt instead a hyrid that enables customers the freedom to select their very own preferred data needs and usage requirements without any contacts and commitments. The unifi mobile #BEBAS boast #anythingiwant #paywhenever #noexpiry all within its newly unveiled mobile app, mobile@unifi. 1 milliom complimentary 20G SIM cards up for grabs! To mark the launch of the new mobile #BEBAS, unifi will be giving away 1 million complimentary 20G SIM cards for all Malaysians! All you need to do is download the app, and place your order. 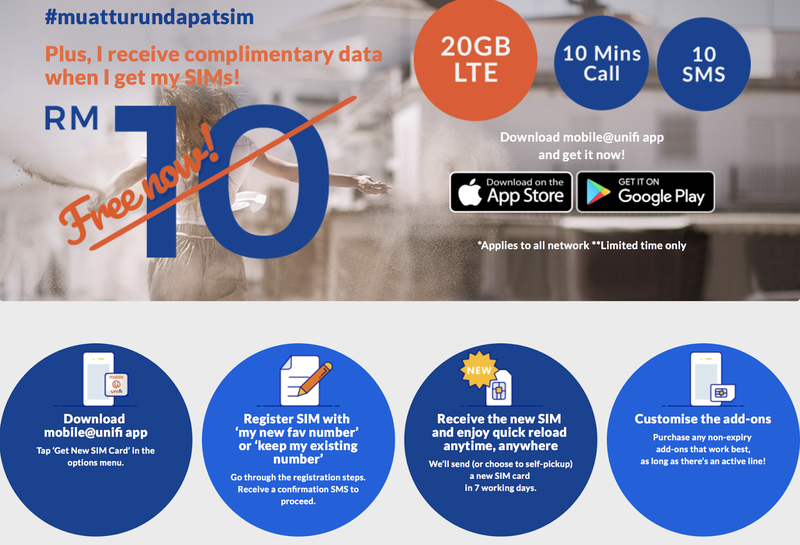 Upon registration, you may then collect your SIM cards at any TMpoint outlets nationwide or opt for delivery for RM10.60. So what are you waiting for? Intall the app now! 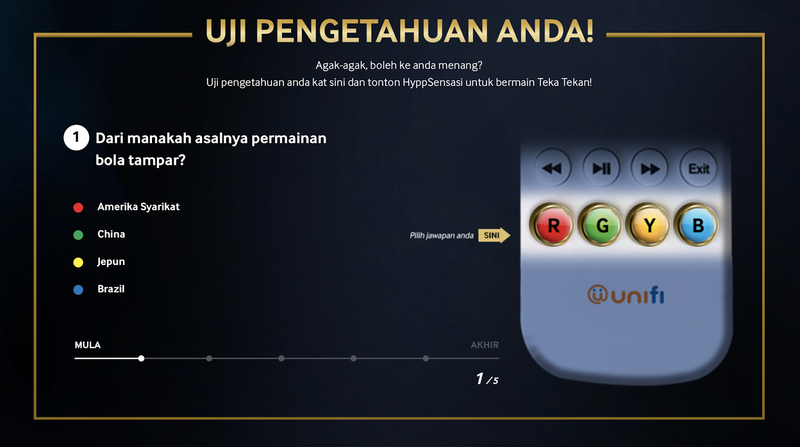 The newly rebranded unifi TV (formerly known as HyppTV) has launched Malaysia's first of its kind LIVE interactive game show called Teka Tekan, which allows viewers to engage with the show from the comfort of their homes and stand a chance to win RM20,000 cash prize daily. The show has premiered on HyppSensasi (Channel 116) and is open to all unifi TV customers. To participate, all you have to do is, grab your remote control and answer five (5) questions during the live game show by pressing the #button, and corresponding colored button on their remote control for the answers. The show will be hosted by 4 local celebrities namely Acong Sweet Child, Farouk Hussein, Shuib Sepahtu and Anas Ridzuan. Teka Tekan is also brought to you y Huawei, as the sponsor for the first ever LIVE interactive game show! 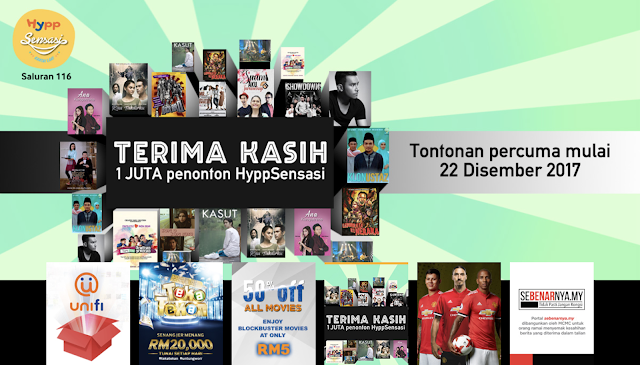 In conjunction with this exciting airing, HyppSensasi HD is offering FREE viewing for all viewers to participate in the game show and other local entertainment programmes available on the channel. Besides that, the mobile app HyppTV Everywhere is also known as unifi PlayTV. Customers can continue to enjoy world-class entertainment and award-winning shows through its value for money channel packages in full HD from either Live TV, Video On Demand or Interactive channels offering while enjoying the service uninterrupted regardless of any weather. 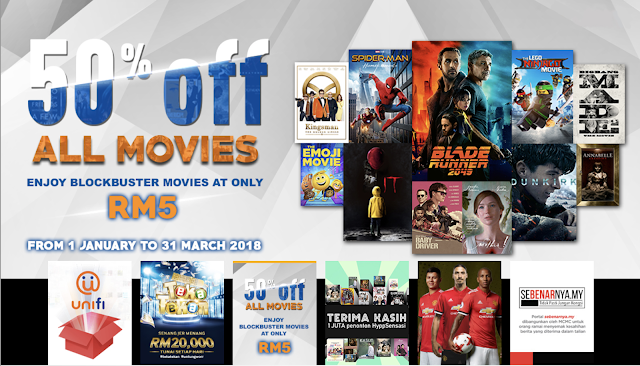 unifi offers 50% off all movies! And more local movies to watch for free! Wow! That's a whole lot of affordable and great deals. They just changed name or something right?